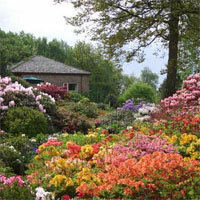 Lea Gardens is a unique collection of highly acclaimed rhododendrons, azaleas kalmias and other plants collected from the far corners of the world. The Gardens are sited on the remains of a medieval millstone quarry and cover an area of approximately 4 acres (1.6ha) on a wooded hillside. The excellent rock Garden contain a huge variety of alpines with acers, dwarf conifers, heathers and spring bulbs. We may be reached by leaving the A6 at Cromford, signposted to Lea; or by leaving the A615 between Tansley and Wessington again signposted to Lea.